Ross Laris and his family pull no punches when it comes to NHRA/Lucas Oil Drag Racing Series and they rolled into Gainesville for the “Baby Gators” and grabbed a Wally in Top Dragster along with being the Number 1 Qualifier to kick off the 2019 Season. “I know racers say they expect to win when they come to these events,” stated Ross Laris, President of Laris Motorsports Insurance, “However, we must have picked up a bunch of hitch hiking gremlins on the trip over, because it was not easy and I was doubting our luck a couple times,” laughed Laris. Laris’s statement referring to just small things mechanically being bothersome during the weekend. 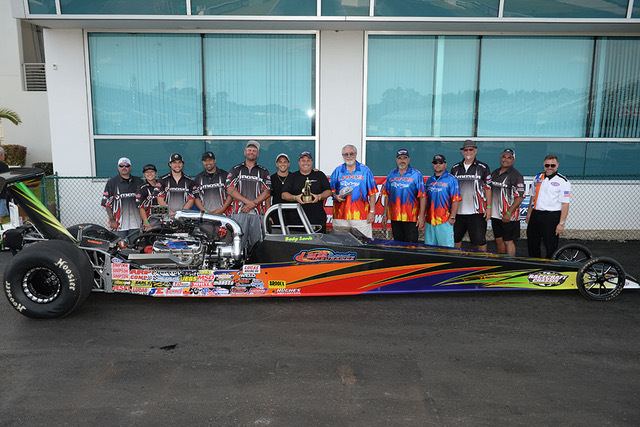 The Laris family debuted a new Danny Nelson dragster for Holden Laris that is a “twin” to Ross’s Top Dragster vehicle. The two vehicles just had pestering corrective actions all weekend, however it did not stop Laris from finding the winner’s circle. “I have a group of supporting people that make this easier on Holden and I to show up and race, we have to keep the family business going and the guys make it happen,” Laris continued, “I had luck when I needed it, drove well when I needed too, I guess you could say that Number 1 Qualifier worked out good for me,” Laris laughed. The Laris Motorsports Team will have a few days off as they prepare for a hectic schedule of National and South Central Division events in Top Dragster and Super Comp competition. Lucas Oil Drag Series South Central kicks off in Houston this weekend.